Gold is a highly sought after precious metal for fine jewellery and is the most popular choice of precious metal for wedding rings as well as earrings, pendants, necklaces and bracelets. 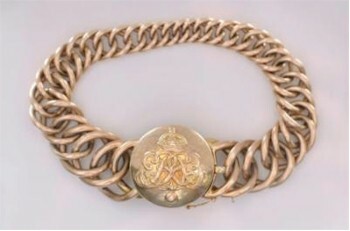 An early 20th Century gold graduated curb link bracelet, which is representative of the gold jewellery regularly being sold in the jewellery auctions held in our Westcountry salerooms. Gold jewellery is used so universally, mainly due to its beauty, colour and lustre; the most popular colour being yellow gold, followed by white gold and rose gold. The properties of gold itself make it the best metal for making extremely intricate and elaborate designs. Gold jewellery is usually stamped with a marking or a hallmark to show the purity/type of gold. For example, a stamp for 9ct gold will usually be '375', '9ct', '9kt' or '9K'. This stamp will only indicate the carat of metal. 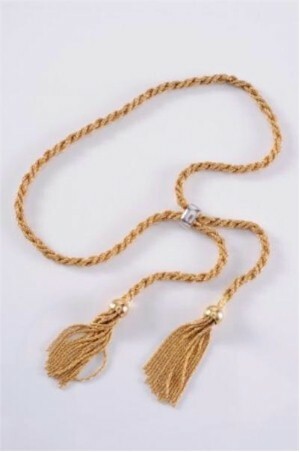 An 18ct Gold Rope-twist Necklace (FS18/190) that realised £1,350 at auction. Hallmarks tell you more about the gold and is an indication that an item of jewellery has been independently tested at an Assay Office and guarantees that it conforms to the legal standards of precious metal content. A stamp will indicate the purity also, but this is not always a guarantee. French marks were used for many years during the late 19th Century and can determine the age and gold content of gold jewellery. The higher the proportion of gold used in the final metal, the more valuable and expensive the metal will be. An 18ct gold ring will be more expensive than a 14ct ring and a 14ct ring will be more expensive than a 9ct ring. Gold jewellery will always reach at least it's value in gold.